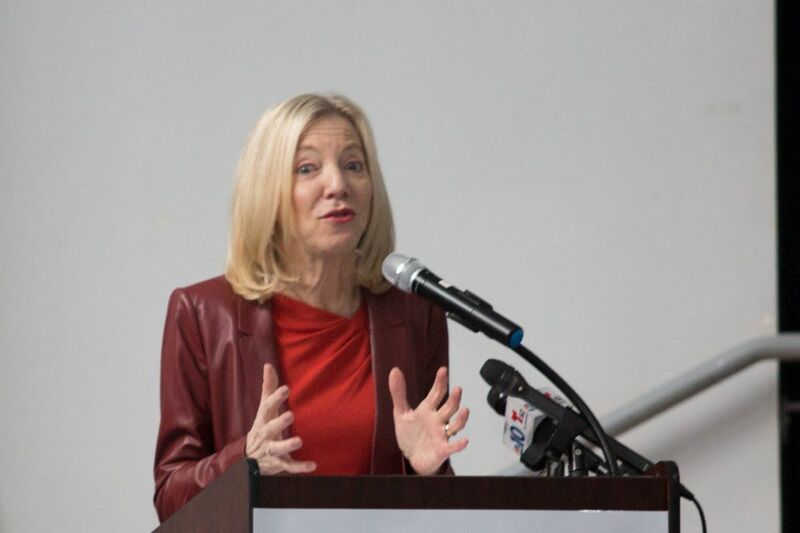 Amy Gutmann, president of the University of Pennsylvania, speaking at Penn Alexander School. With the University of Pennsylvania continuing to heavily invest in the fossil fuel and coal industries, you couldn't help but notice the hypocrisy when Penn president Amy Gutmann signed a pledge with 11 other university leaders on Monday reaffirming its commitment to the environment. Penn Fossil Free, a student group spearheading the campaign for divestment, estimates roughly $300 million of the university's endowment is invested in fossil fuel assets based on the university's most recent financial report in 2014. Ever since this report was published, the student body has campaigned for the university's divestment from fossil-fuel companies – a struggle that continues today. In 2015, 87.8 percent of the participants in a campus-wide referendum voted in favor of divestment, and a 48-page proposal was created outlining the fossil fuel industry's history of environmental damage, displacing families, and of course, the overwhelming scientific evidence that the industry is fueling climate change. Penn has divested in the past. In the 1980s, the university divested from businesses associated with South Africa's apartheid regime; in 2006, it withdrew investments in Sudanese oil companies because of the genocide in Darfur, and most recently, it divested from HEI Hotels and Resorts due to its unlawful anti-organizing practices and inhumane working conditions. While climate change may not be as visceral as a genocide, with the ice caps melting, sea-lines slowly rising, and the looming possibility of a global extinction crisis, surely the fossil fuel industry falls within the "morally evil" category, right? Apparently not. In a statement issued by the university Ad Hoc Committee, the group that ultimately determines whether to divest, the fossil fuels proposal did not meet the criteria to be considered morally evil. Yet the committee called climate change the "critical global challenge of our times" in the following sentence. It seems that for climate change to be considered morally evil the state of our planet must be beyond repair – a deadline that scientists say is fast approaching. As I write this article, I recognize my own energy consumption as an average citizen. While I try to recycle, carry around my own reusable water bottle, and use public transportation, I'm commenting on fossil fuel divestment as a consumer. Right now, fossil fuels power the day-to-day activities of almost all of us, but to secure a healthy and hospitable world for future generations we need to be critical of the energy investments of large institutions, such as Penn, in the city of Philadelphia. The University of Pennsylvania has made a concerted effort to promote sustainability locally, and I applaud those efforts, but it is disingenuous for the university to continue to flaunt its bubble of sustainability while financing morally dubious industries that promote the use of fossil fuels. The pledge that Gutmann and the Penn administration signed called for a "commitment to accelerate the global transition to low-carbon energy." It is time for the university to be held to that standard. James Meadows is a University of Pennsylvania student interning at Philadelphia Media Network.